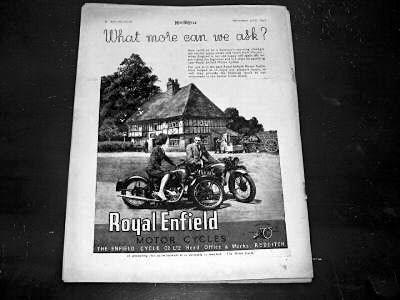 Speaking of advertisements for Royal Enfield motorcycles, here's a quiz: can you pick out the one slogan or catch-phrase Royal Enfield did NOT use over its many decades? The answer is at the end. Answer: You Meet the Nicest People on a Honda, not a Royal Enfield. "You meet the nicest people on a ..." This was used by Honda in the very late '50's to early '60's. Made Like a Gun - This is the official tagline of Royal Enfield. I love this machine..! !